Hi, my dear readers, have you ever tried to make something by yourself? Here I find one jewelry making lover – Tatyana Popova, who has made a series of gorgeous jewelry designs including brooch, necklace, bracelet and etc. WOW, it’s really excellent! I really can’t wait, let’s appreciate those crafts one by one. Materials: Lemon chiffon pearl beads, mixed color seed beads strand and red copper headpins. Do you like this flower brooch? It’s really elegant, giving me a feeling of retro nostalgia. Moreover, it’s suitable for any occasion, friends’ wedding, dancing party, dating, etc. If you are interested in it, just have a try, maybe you can make it more special. Materials: Czech glass beads, gemstone beads, brass earring hooks. These vintage earrings are really exclusive, fanshaped with brown glass beads, which looks very simple but do not miss grace. They are very suitable for women who wear a suit, do you think so? Materials: Silver earring hooks, electroplate glass beads including AB color and rainbow plated, black seed beads. How about these glass beaded earrings? It might take a while to make such delicate earrings, but they definitely deserve your time. Moreover, you can choose your favorite color of glass beads, such as bright colored beads, it may have different feelings. Materials: Transparent acrylic beads, non-magnetic synthetic hematite beads and Tibetan bead caps, black seed beads. We insensibly come to the last one I share with you today! This vintage pendant necklace is my favorite one, because the Tibetan style flower pendant is special for me. Of course, you can make a pendant in any shape as you like. Just follow your heart. Hi, dear readers. It is Wednesday again. Are you expecting today’s Pandahall customer show? 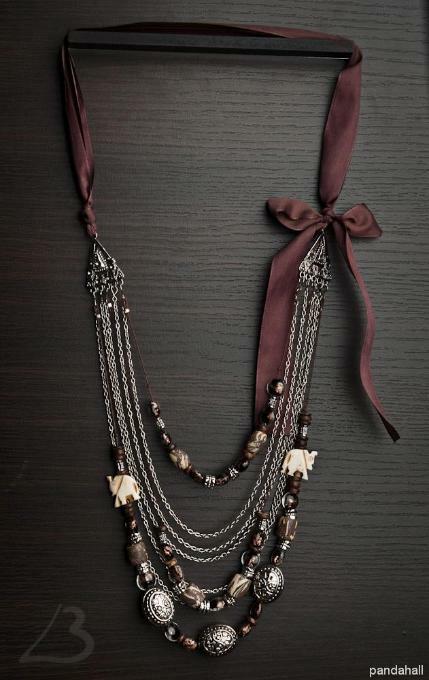 Are you a fan of Tibetan style jewelry? Look here if you exactly love this kind of jewelry, I am going to show you a series of Tibetan style jewelry made by our Pandahall customers. Trust me, you will love them! Look at this beaded pendant necklace, cool design, right? You can prepare the supplies and make a similar one according to this picture. It is not very hard, and you will know it if you are willing to try it! The crystal jade beads look amazing, yes? You have to make four jade beaded dangles with headpins and hang them onto the chandelier component link. I believe you can do it. Then add the leaf pendants onto it. Now, do you like this pair of chandelier earrings? All of parts of this bracelet have been connected by Tibetan style component links. So we have to attach the beads dangles and links in order. You also can change the color of the acrylic beads, how about blue? It is clear that this Tibetan style pendant looks like mirror, don’t you think so? How do you think of this idea that put your own photo into it or any other photo you like? It may be great to make it for your friend as a gift with her picture. It is a little pity that I can just show four pieces of them, have you found your favorite one? Then why do not you try it? Expecting for your nice works! Vintage jewelry has become one of the hottest jewelry trends in recent years. Do you know the origin of this word “vintage”? A long time ago, it was described as wine bottled in the vineyard. Now, it has two meanings, one is used to describe something very old and at least have several decades of history. The other one describes something newly manufactured, it’s a fashion style – vintage style. Today, I will show some vintage style jewelry made by our customers and crafters. Our customers use different materials to make the vintage jewelry, Such as the vintage style earrings, vintage necklaces, vintage jewelry bracelets and so on. Thanks for Надежда Жмакина for sharing this beautiful vintage style earring. 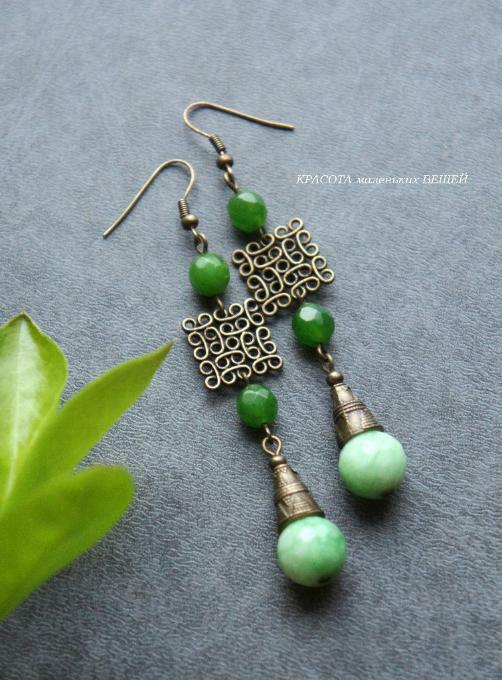 This earring is made with tibetan style bead caps, antique bronze chandelier component and jade beads. You can also make the vintage earrings with some Tibetan style pendants. This vintage chandelier earring is made with freshwater shell pendants, antique bronze chandelier component and tibetan style leaf pendants. This is designed by our customers Radka Bílková. This Bangle “Birds” bracelet was designed by Anastasiya Markova. It made with antique golden link, Tibetan style spacer beads and glass beads. The mix of different kinds of beads, make the collision of different design. 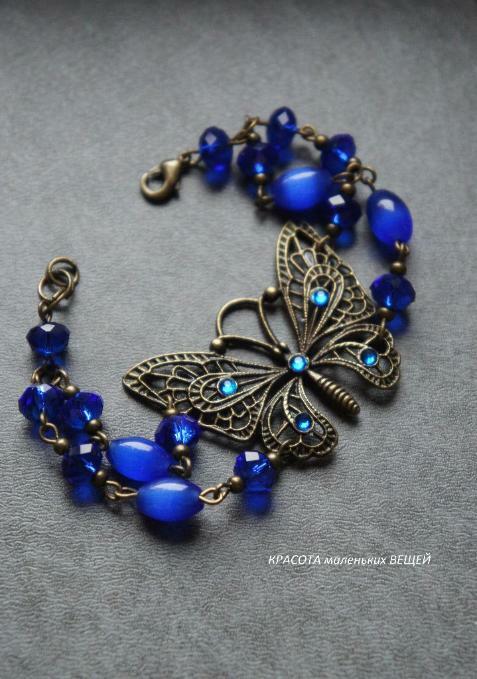 Here is our customer Надежда Жмакина design using the Tibetan Style Big Butterfly Pendants and blue glass beads. Pandahall customer Rui Dias uses their Tibetan style alloy vehicle big Pendants to make this antique style charm necklace. This vintage style necklace was made by Lubica Brnova, mixed with Tibetan Style Beads, Handmade Gold Sand Lampwork Beads and Wood Round Beads. Revekka Lagoudakou make this with Tibetan silver flower links, Synthetic Turquoise Beads Strand. Have you found the one you like? 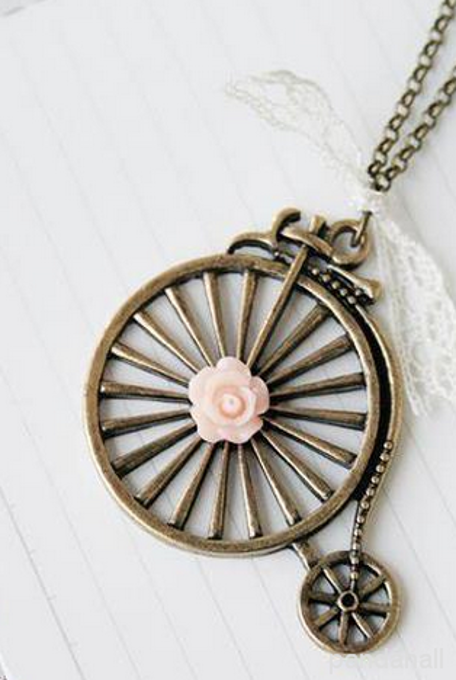 If you like these vintage style jewelry, don’t forget to share it! Thank you!